September 2006 - Hood Canal is having its annual low oxygen event, but it appears to be even worse than previous years. Many critters were stressed, many were already dead. The invasive tunicate, Ciona savignyi, has taken a firm foothold in this location now. We did two dives at Sund Rock, and here is what we found. All photos by Janna Nichols, please contact me at pnwfishlady@comcast.net if you'd like permission to use. 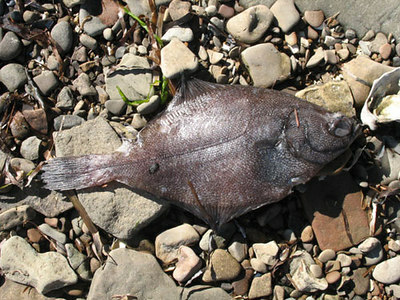 We also saw a few Rock Sole washed up on the beach too, along with a good sized male Kelp Greenling.